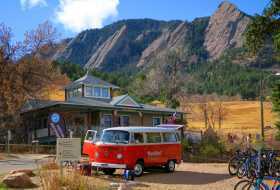 If you&apos;re traveling to Boulder with little ones in tow, you&apos;ll have no problem finding ways to entertain them. 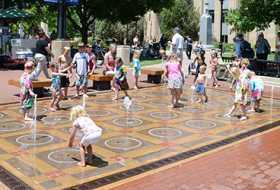 The Pearl Street Mall, in particular, has endless diversions for kids, including fascinating street performers and strategically placed play areas for children. Judging by the squeals of delight you&apos;ll hear as you get near the pop-jet fountain at Pearl and 14th Street, this may get the kids&apos; vote for best Boulder attraction. 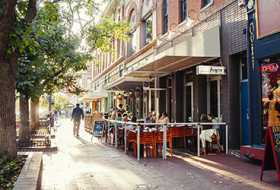 Plenty of downtown businesses cater to kids, too. Into the Wind kite and toy shop is positively overflowing with clever trinkets and gadgets to enthrall little ones, while Boulder Book Store will delight parents and kids alike with fantastic books and toys. Color Me Mine offers a chance for kids to get creative as they paint their own pottery. A tour of Celestial Seasonings, one of North America&apos;s largest tea factories, is a fun, warming winter outing for kids over 5. Or make an afternoon of visiting the University of Colorado campus: At the CU Heritage Center, check out the astonishing Hit the Bricks! LEGO display — a replica of CU created one LEGO at a time. The CU Museum of Natural History&apos;s interactive children&apos;s exhibits include a massive triceratops fossil and a play area downstairs. And don&apos;t miss the family programming at CU&apos;s Fiske Planetarium, one of the world&apos;s most advanced projection systems. Find more ideas for indoor family fun here. Of course, even in winter, you&apos;ll want to plan some outside time. If it&apos;s snowy, hit Boulder&apos;s sledding hills, head to Eldora for family-friendly skiing and snowboarding terrain or go for a winter hike (there&apos;s no such thing as bad weather, just bad clothing!). Many of the paths around Chautauqua Trailhead are kid-friendly, and the Ranger&apos;s Cottage here offers free nature discovery packs. Also try Wonderland Lake, Settler&apos;s Park and South Mesa trails. For a fun biking outing, the free Valmont Bike Park (named on this bucket list) has three pump tracks, one of which is for toddlers. Splash on the banks of Boulder Creek at Eben G. Fine Park or head out to the Boulder Reservoir for beach time and water recreation galore, or please your little fishies at one of a handful of great swimming pools in Boulder. 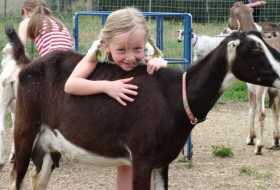 Of course, if it&apos;s just good old-fashioned playtime you want, consider Gateway Park Fun Center in North Boulder. Kids of all ages will be swept up in the mini golf course, go-karts, batting cages, human maze, an indoor arcade and more. 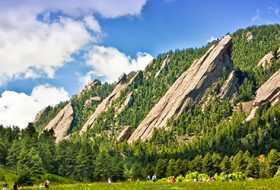 Also check out the city of Boulder&apos;s 10 ideas for nature play or Mile High Mamas&apos; list of ideas for summertime family fun. When it&apos;s time to eat, here are 5 Boulder Restaurants for Picky Kids, according to 5280 Magazine.